Maybe they look O.K. to you, but not to an army of engineers, research experts, artists, sculptors, draftsmen and model makers who are busy right now figuring out ways to make those productsâ€”and thousands of other thingsâ€” look better, work better and sell better. “Nothing made by man is perfect and, besides, a competitor may come out with some improvement”â€”that seems to be the philosophy of the industrial designer who is either a combination of these craftsmen or an employer of their services. Today, industrial designers are working harder and faster than ever before. Employed by big and little manufacturers anxious to meet the pent-up demand for automobiles, household appliances and other articles, designers literally are shaping the things to come. To correct a common misconception, it should be stated here that an industrial designer is not just someone who draws pretty pictures of sleek streamlined automobiles, airplanes and locomotives. Some people describe industrial designers as artist-engineers. It is obvious that designers sought by successful manufacturers must be practical men whose creations, although representing improvement, avoid startling the public. The automobile industry had a notable experience with a too-advanced model 12 years ago. One manufacturer introduced a car whose streamlining was years ahead of current models. Customers stayed away in droves. Yet most cars today incorporate many of the streamline features of this trail blazer. To gain consumer acceptance, design changes have to come slowly and graduallyâ€”not all in one jump. Another requirement for industrial designersâ€”if they want to stay in businessâ€” is the ability to fashion improved products that don’t necessitate too much change in a manufacturer’s production equipment. It stands to reason that an industrialist can’t change his whole factory every time his designer gets an idea for a fancier looking coffee pot, for example. A third “must”â€”probably the most importantâ€”is that industrial design firms find how to improve the performance of various products. Make them lighter for easier handling. Make them operate more efficiently, more economically. Make them better! Designers often come up with a suggested appearance change that in itself will make some device more useful. And sometimes it takes years to sell these ideas to a manufacturer, possibly because all his competitors are still following the same old pattern. Here’s an example. In the early 1930s most electric refrigerators stood on legs about four inches high. One firm called its model the “broom high” refrigerator and extolled the advantages of housewives being able to sweep under the appliance. One farsighted designer asked the company’s top executives, “Why don’t we eliminate the legs and put the refrigerator flat on the floor? It would look more attractive and there would be no need to sweep under it.” Years passed before his idea was adopted. Since the end of the war, industrial designers have been called upon to provide a new serviceâ€” to find peacetime products to be made by hundreds of small war goods manufacturers who came into being since Pearl Harbor. Not only has it been the designer’s job to pick out products that are apt to be in demand, but also to select products whose manufacture fits in -with existing machine tools and other production equipment. Barnes & Reinecke, Chicago industrial design firm, has been a leader in this field. Here are a few of some 300 fast reconversion jobs engineered by James Barnes and Jean Reinecke, both still in their thirties: During the war, a small manufacturing plant kept busy day and night turning out aluminum parts for bombers. Came the contract cancellation and the humming of production machines stopped abruptly. Barnes and Reinecke were summoned. They made a survey of the plant, studied the production machines, raw material on hand, the skills of the workers. In 48 hours, the two designers and their engineering staff had a rough reconversion blueprint ready for the distraught manufacturer. It included sketches and tooling and production layouts for making a streamlined, step-on-a-pedal garbage pail from leftover bomber segments. Another small firm went out of the war business and had on hand a large supply of fuselage steel. Production equipment included paint spraying outfits and machines to stamp out metal parts. 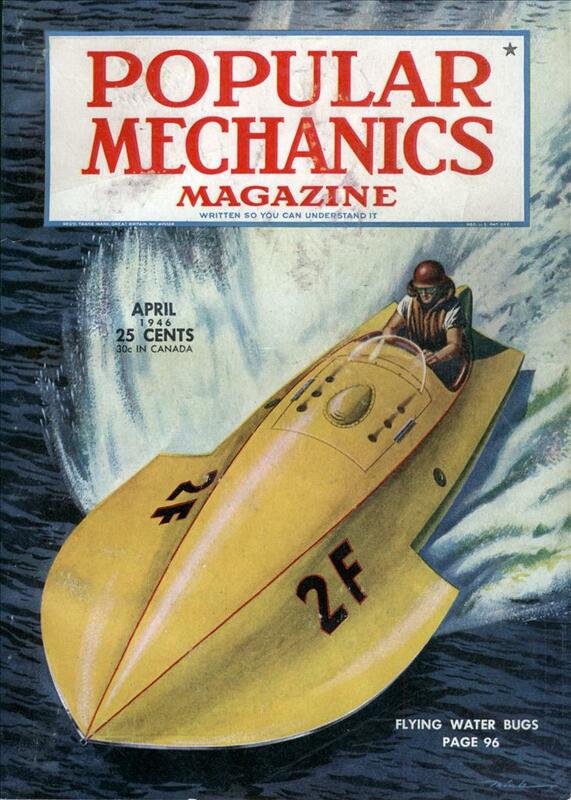 “Why not start making metal toys for children, perhaps a streamlined auto racer?” Jean Reinecke asked. The manufacturer said the idea sounded good to him. The designers fashioned the model of a toy auto, and soon it was in production. The changeover in a third war plant resulted in a switch from aircraft” parts to a device which recaps bottles of ginger ale and other carbonated drinks to preserve the “fizz.” Most hardware stores are anxious to get these items. And now for a peek into the future to see what industrial designers are planning for the days that lie ahead. In the first place, most designers agree that the appearance trend for the future will be toward simplicity. From door knobs to locomotives, the accent will be on neat, clean lines, with a definite avoidance of fancy frills. “Things will be better proportioned,” was the way one top-ranking designer put it. To get down to cases, here are some forecasts of possible future trends by two design firms: W. C. Nichols and Walter F. Nessen, of Product Designers, Chicago, predict increased use of light-weight metals, particularly aluminum and magnesium alloys, in building automobiles. The versatility of these metals, the designers point out, has been demonstrated by many types of warp lanes and other equipment. And the public is anxious to reap the benefits of these lightweight metals in products with reduced weight and improved performance. “To realize full benefits from the use of light metals,” Nichols explains, “products must be engineered from one end to the other. Experience has shown that partial use of light metals does not pro-vide the full benefits that we are seeking.” As an example of what he contends can be done in the automotive field, Nessen has prepared a group of design studies of new automobiles, “In approaching this assignment,” Nichols reports, “we set aside all conventional ideas to develop a design that would incorporate the use of light metals from bumper to bumper and at the same time lend itself to mass production techniques.” These lightweight cars would have extremely wide aluminum doors; grilles made from rolled aluminum rather than being stamped or die cast; bumpers made from an aluminum stamping, or cold formed, rolled aluminum alloyed to a structural strength equal to the same gauge thickness approximately the same cross-section of steel. The weight saved on the front bumper would, permit an extension of a bumper all the way around a car without increasing car weight. Further weight reduction would be achieved by the use of lightweight metals for hoods and wheels. 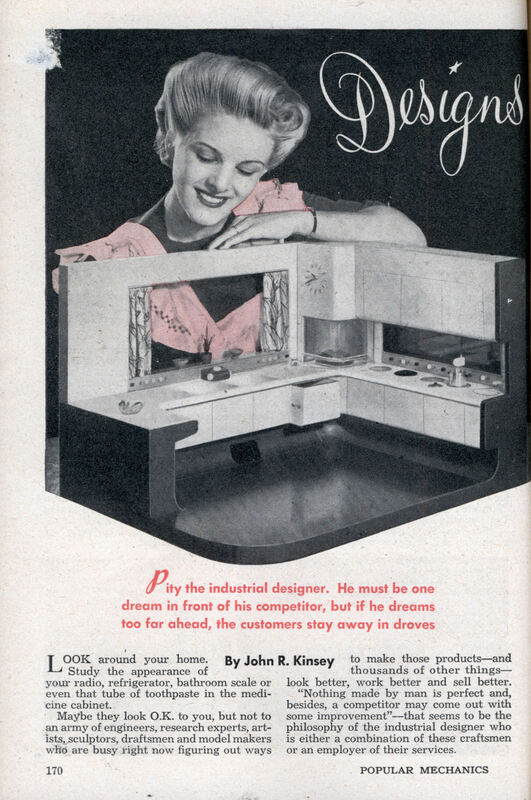 Turning from automobiles to homes, here is an interesting idea for the kitchen of tomorrow as expressed by Ralph Kruck, New York designer: “It wasn’t so many years ago that houses were built without storage and clothes closets, without centralized heating. It is only of recent date that dish closets, broom closets and the like were built as part of the kitchen. “The kitchens I see in the future will carry this scheme still further. Kitchens will be sold as a whole to home builders. The day will come when housewives would no more think of buying a stove here, a refrigerator there, and a sink from someone else than they would buy an engine from one manufacturer, four wheels from another and a body from a third and expect it to work as well as a properly integrated modern automobile. Kruck visualizes the manufacture of appliances which incorporate a refrigerator and a range, or other equipment, in one unit. An electric cooking unit would be so designed that it could slide out of sight after food was cooked. Stick around, folks, a great day is coming!